Hey Vegan! 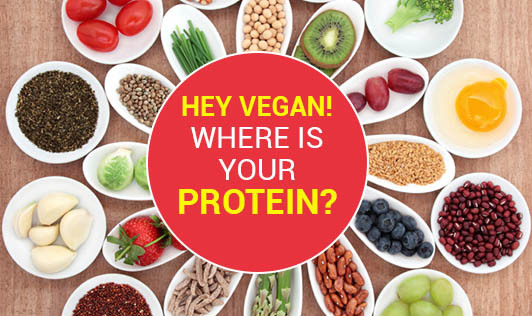 Where is Your Protein? As a child, life had been so simple! Answers to the most complicated questions seemed easy! Of late, the amount of science revolving around us has successfully left a number of us so confused that we have lost our simple ways of thinking and are always looking for the ‘scientific evidence'! Like the author of the famous book, Diet for a Small Planet had to reconsider her theory due to lack of scientific evidence, several explanations have been discarded due to the same reasons. She claimed that vegetarian sources of proteins were incomplete and they had to be combined with different sources of food to provide a vegetarian with good proteins for their body. Although the theory was rejected by a number of scientists, the idea had slipped into the cautious vegetarian minds that they had already begun making food combinations and still continue to do so! Do you really have to be worried about your diet not having enough protein if you are vegetarian? The answer is definitely no! Proteins make up every living cell in plants and animals. Amino acids are the basic building blocks of these proteins. Some of these amino acids are synthesized in our body while some of them need to be supplied to us through our food. All plant and animal food sources contain these necessary amino acids in certain proportions - some higher in animal foods and some higher in plants. It is true that animal sources have higher proportions of these amino acids, but it doesn't mean all plant sources are deprived of them. In fact, it is very easy for a vegan to meet the recommendations for protein, as long as calorie intake is adequate. You don't have to combine specific foods together to get your protein dose or eat specific combinations in each meal, but instead simply have a variety of foods through the day! You must look at giving yourself an adequate supply of all the essential amino acids over a period of a few days to a week, which is definitely not challenging. Several plant-based foods like gluten of wheat, soy and its products, quinoa, hummus, broccoli, beans, seeds, nuts and pulses do contain all the essential amino acids in them in quantities that can be compared to non-vegetarian sources. The problem with a vegan diet could arise only when one eats a diet that is heavily dependent on a single food group like fruits, or just roots and tubers, or just junk foods. Without doubt, it is hard to find a population that depends only on one of these categories! Moreover, for all those meat lovers out there, so proud of getting all your protein, remember that meat often comes with a lot of cholesterol and fat that you need to be cautious about! So, all you vegans don't have to be worried about your protein fix. Just consult a nutritionist who will be able to guide you in balancing out your diet. Happy eating!